Two more albums by Emerson, Lake & Palmer are to be remastered and reissued later this year. The trio’s back catalogue was signed over to BMG in November 2015 which has seen the label re-release most of the band’s material since. Now it’s been announced that their final two records, 1992’s Black Moon and 1994’s In The Hot Seat, will also be reissued and released on July 28. Like the previous re-issues, the two albums have been remastered by studio engineer Andy Pearce and will be available on CD, 140-gram vinyl and HD digital download. The CDs will contain extensive liner notes, rare photographs and band interviews by journalist Chris Welch. Black Moon will feature all 10 original album tracks along with edited versions of Black Moon, Affairs Of The Heart, Paper Blood and Prokofiev’s Romeo And Juliet. The reissue will also include the Live At The Royal Albert Hall release which first came out in January 1993. In The Hot Seat will feature all the original album tracks along with live cuts which were first heard on 1998 double album Then & Now including Tiger In The Spotlight, Hoedown and Keith Emerson’s solo piano hit Honky Tonk Train Blues. Both albums are available for pre-order via a PledgeMusic campaign. Find out more. Carl Palmer’s ELP Legacy will head out on a UK tour later this year. Find a list of live dates below. 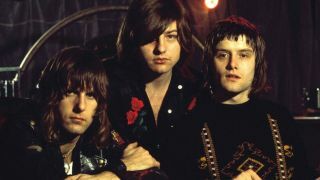 The Emerson, Lake & Palmer Quiz: how well do you know this iconic prog trio?